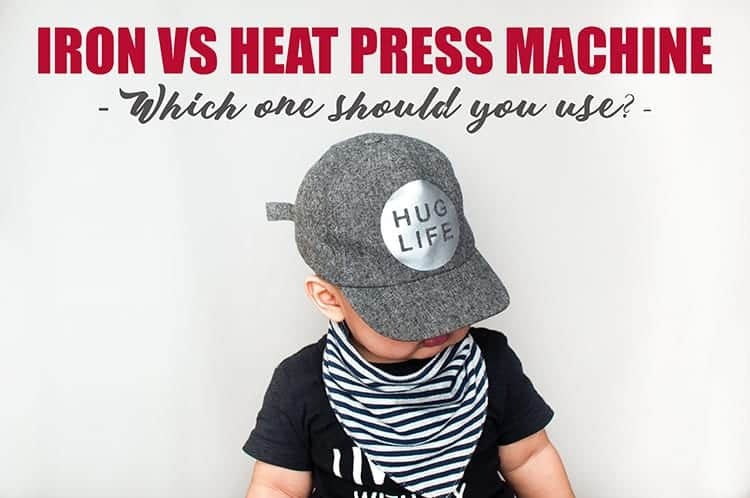 In our post today we will have a heat press vs iron battle-off. A successful heat transfer is all about having the right time, temperature and pressure. If you can get those three elements right, you will have a heat transfer that is perfectly adhered to your products of choice. Get those three wrong and your transfer won’t stick to your surface very well and will most likely come off in the near-future. Let’s look at the pros and cons of each and discuss which tool would be best for your specific needs. Irons are a great tool to have around a home. You can do so much more with an iron than simply iron clothes … in fact, I think my iron almost never gets used to iron clothes, it mostly gets a work out for craft purposes. Irons are great because they are cheap, they are easy to store and easy to port around. And most households already have one, so you don’t even have to purchase one. If you do wish to work with an iron, we do recommend that you purchase decent iron-on vinyl as not all HTV are as easy to apply with an iron as others. Here are some pros and cons of using an iron for iron-on transfers. They have a small surface area for pressing, so impractical for larger designs. It doesn’t have a digital timer built in, so you will need to watch the clock or count-down in your head whilst transferring your design. The temperature can vary wildly throughout the surface of the plate. Some areas might be super hot whilst others are only warm. This means that you might end up with an iron-on that doesn’t stick as well as it could. Steam irons have holes in the hot plate which will create an uneven pressure. Irons are an excellent choice for those who are beginners. They are also perfect if you know that you will only be doing heat transfers only occasionally (so it won’t make sense to invest in a heat press then). We definitely don’t recommend them for larger projects, but they can work great for smaller designs. 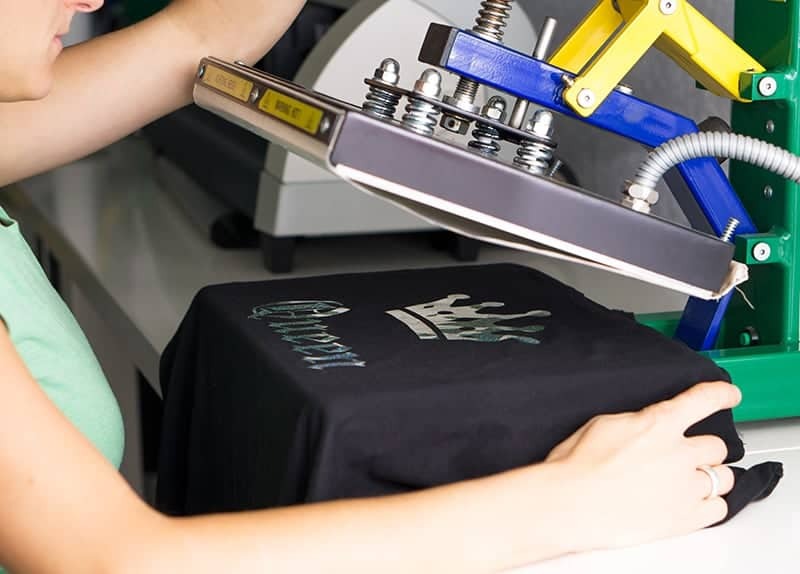 Don’t expect your design to last forever, as durability of the iron-on is much shorter in lifespan in comparison to those adhered with a heat press. ecause you can’t control the temperature and pressure with an iron, you iron-on transfers are more likely to peel. For more professional results, we highly recommend that you invest in a heat press. Also, check out our guide to the best HTV vinyl for info on which vinyl’s work well with an iron. A heat press is, of course, the professional tool for applying heat transfers. Unlike irons that have been designed too well … iron wrinkles out of clothes, a heat press has specifically been designed to heat press designs. They are fabulous for those of you who know that you will be working with iron-on on a regular basis. Here are some pros and cons of using a heat press for iron-on transfers. A heat press is a machine that has been designed specifically to adhere transfers to garments and products. As such you can control the exact temperature, adjust the pressure as well as set a timer to help you get a perfectly adhered designed. The temperature of the plates are also evenly distributed and the larger work area (typically around 15″x15″) will allow you to work with larger designs. Without a doubt, a heat press will help you to create more professional and longer-lasting heat transfers. We won’t even bother with the frustration and hassle of using an iron. With an iron, it really comes down to good luck. With a heat press, it is all an exact measured science to get the best results. Fortunately, you can find some really affordable heat press machines these days. Why not check out our heat press machine reviews to help you find the best starter heat press for you and your needs, you can find out more about how much a heat press costs here. You can also find some great buying tips of what to look for your heat press here. Remember, you will also need some other tools in order to get started with t-shirt HTV transfers, you can find a list of the tools and supplies you need here. Hope that helps you with your question.